Each time we are emotionally wounded, we internally tuck away powerful reactions to the cause of our suffering. Years and years may go by as we continuously store psychological traumas deep inside of our psyche. One random day an event may occur that makes us realize, there is a lion inside of us that is ready to roar. The potential of anger and the capacity in which it eventually needs to be released, is perhaps one of the most mysterious phenomenons. 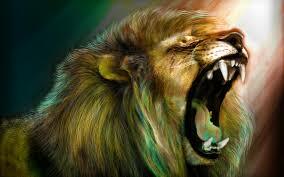 Most of us are afraid of our own anger, our internal irritabilities can come across as strong hostility, it may take very little provoking to infuriate us at any given time, once the lion awakens, it is nearly impossible to charm it asleep again. The wildcat that grumbles deep within our belly, then must be tamed. There is a leo inside us all, the difference is in the size of the claws, one humans pain is like the pain of no other, each of us carries our wounding in very different ways. Anger is a very natural reaction to that which hurts us, if we are unable to release our anger at the time of our pain, it doesn’t go away, it will only fester over time, like an open sore that is not tended to properly. If we are known to the world as a quiet and passive human, then the roar of our lion will exasperate those that are there as a witness, sometimes it just can’t be helped. For people to see us in a costume that is unfamiliar to them, will arouse their ego’s, let the drama begin! The wildcats heart is building energy, you can feel it and it is making you anxious, what is the best remedy to release the roar so you may feel greater peace? Exercise will help, going for a walk will bring your stress levels down, a run or a swim, yoga or chi gong. Understanding the rage is productive in letting it go and releasing it. There is a sigma attached to anger, humans see it as a ‘bad’ emotion that you shouldn’t have, this is so far from the truth, anger is a natural cause that arises and one that we should give ourself permission to express. We must learn a healthy way to release our anger, the wild beast won’t leave us until we do, we will not experience spiritual healing unless we can release the grief locked deep inside.